← Maintenance Treatment – Is it really necessary? There are so many potential things which afflict the back and neck, I can’t possibly tackle them all here, but I’d like to spend a few lines talking about facet joints! 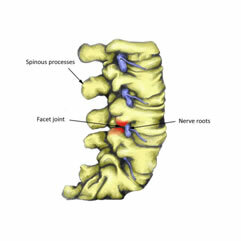 OK, I hear you ask, what are facet joints, and what do they have to do with neck and back pain? I’ll see what I can do to answer these questions. Each bone in your neck and back has two surfaces toward the side and back which form joints with similar surfaces on the bone (vertebra) above and the one below. These joints glide, and have a structure which is exactly the same as many other joints in your body – they have a joint capsule, cartilage surfaces and ligaments, and they can be injured like any other joint. The ones shown here are in the low back (Lumbar Spine) but the ones on your neck and upper back are essentially the same! Many patients experience difficulty straightening up when, for example, rising from a chair, and if the inflammation affects the nerve root nearby, sometimes there’s some accompanying radiating pain – if the neck is affected this is likely to be along the arm; if the low back is the problem, radiating pain is likely to be down the leg. Initially, over the counter anti-inflammatory drugs such as ibuprofen can be helpful (check with your pharmacist to make sure there’s no reason why you shouldn’t take them!) – also, and this is key, keep moving! These injuries heal much more quickly when the joints are encouraged to move. Usually, treatment involves manually moving the joints to restore mobility and soft-tissue techniques to reduce the accompanying muscle spasm. Sometimes, ultrasound therapy can be used to assist in healing. In addition, we’ll probably give you some straightforward exercises to encourage mobility at the affected region and stretch some of the affected muscles. Facet joint pain can be very sharp indeed, but the good news is that they usually respond to treatment fairly quickly! Read more: What Legal Options Do Victims Of Hit-And-Run Accidents Have?